Here you’ll find more than 30 printable pages and worksheets for a pumpkin theme! Included are pages for math, science, writing, and more! Pumpkin Life Cycle Sequencing Cards – Two sets to choose from. 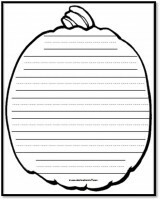 This printable has a full lesson plan for the book Pumpkin, Pumpkin and a printable sequencing page that can be used for learning about the pumpkin life cycle alone or along with the book. 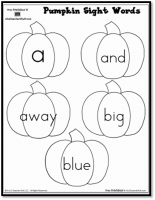 Pumpkin Compound Words – Match the halves of the pumpkins to create compound words. Pumpkin Lowercase and Uppercase Cards – Create a memory game or match uppercase letters to lowercase letters. Pumpkin Lowercase and Uppercase Tracing – Assemble into a ring book or leave on sheets for tracing. 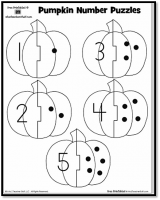 My Pumpkin Counting Book – Preschool-K. Each page has pumpkins to count. Pumpkin Shape Matching – Preschool. Print 2 copies and match the shapes on the pumpkins. Pumpkin Seed Estimation Sheet – Grades K-1. Students estimate how many seeds were laid on their pumpkin. Pumpkin Ordinal Numbers – Grades K-1. Match the ordinal numbers (first, second, third…) to the correct numeral. Pumpkin Card Game – Pumpkin cards with numbers 1 to 10 plus wild cards to play games. 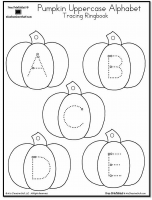 Pumpkin Number Tracing – Preschool-Grade 1. Trace the numbers to practice correct letter formation. Place Value I Have… Who Has? Game (Tens and Ones) – Grades 1-2. 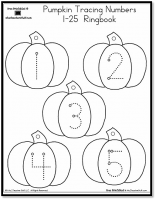 Pumpkin Number Puzzles – Preschool-K. Match the number to the correct number of dots. Pumpkin Clocks for Learning Centers or Games – Grades 1-2. Pumpkin Write-On Clocks – Draw the hands on the clock showing the correct time. Pumpkin Clocks – Match the pumpkin clocks with the correct time. Pumpkins: Counting by 2s – Grades K-1. Pumpkin themed cards counting by 2s to 100. Pumpkin Missing Numbers – Grades K-1. Fill in the missing numbers on the pumpkin number line. Goes from 1 to 36. Pumpkin Lacing Card /Patterns – Blank Pumpkin Pattern and Pumpkin Lacing Card that can be copied onto tagboard to use as a lacing card. These pumpkin-themed pages can be used for pumpkin topics or a general fall / harvest theme. Thanks for all the great ideas. I can’t wait to put them into action. I can’t wait to get everything together! We are doing science themed bulletin boards at my school and I was so looking for something else other than MATTER! October-Novemeber is a perfect time to discuss the pumpkin and its life cycle. Thank you for all of your hard work. My classroom will have a “center” theme of pumpkins. Long Live the Earth! I think these are all fabulous ideas, and I can definitely use some as inspiration in my own lesson plans. Kudos to you!